2016 is almost over. And I have to say that I am so glad because for me, both emotionally and politically it has been awful. I'm not sure if 2017 is going to be a good year for our country, but it will certainly be one that highlights change and the people who are willing to stand up for what is right. That said, there were a lot of really great things about 2016 for me personally. The most important being my finally being able to take both of my children to Spain to meet my father and his side of the family. Making those connections is such a blessing for my children and a gift that is far more valuable than anything I could buy them. In addtion, 2016 was a great year for MommyMaestra. So many wonderful guest contributors were featured on the blog and they all shared remarkable reviews, tips, resources and information. I must thank each and every one of the guest contributors to this site, who share such wonderful content. I also discovered my new passion for creating educational materials that parents and teachers can download and very soon, I'll be unveiling something new and wonderful as a result. 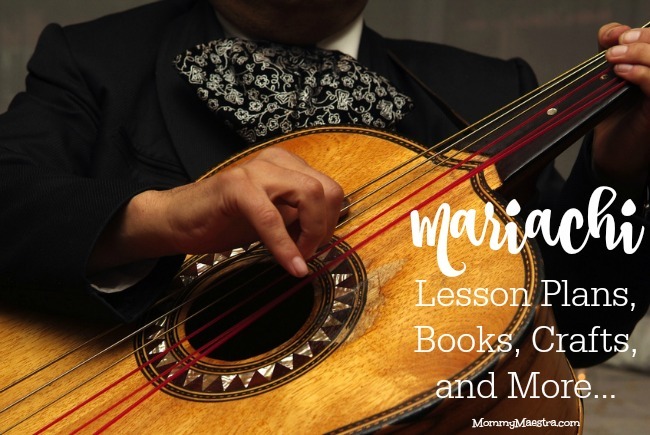 Over the last few years, I've done a "Best of MommyMaestra" post highlighting popular posts (and ones I really enjoyed writing or reading) for each month of that year. It is always so rewarding to go back over my site during the past year and discover which posts were the most popular. But first, I want to thank MommyMaestra's wonderful sponsors who share such fantastic freebies every month to help MM readers teach their children a new language or new skills and concepts. A giant abrazo to Spanish for You!. 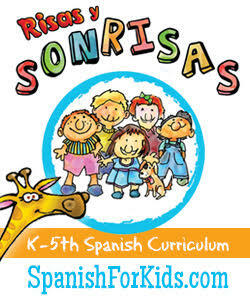 I'd also like to thank Risas y Sonrisas for their support of MommyMaestra and articles to help parents raising bilingual children. I want to encourage each of you to visit their sites where you'll discover wonderful products to help you raise multilingual kids. 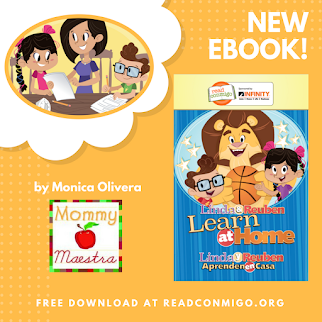 And if you are a parent or educator who has downloaded their free content from MommyMaestra, please take a moment to just say thank you to them so they'll be inspired to continue to provide you with such great materials. Please remember: MommyMaestra is always looking for guest contributors. Maybe this is the year when you will sit down at your computer and type up your first article sharing your experience. We want to hear and share your stories to inspire other Latino families to get involved in their children's education. 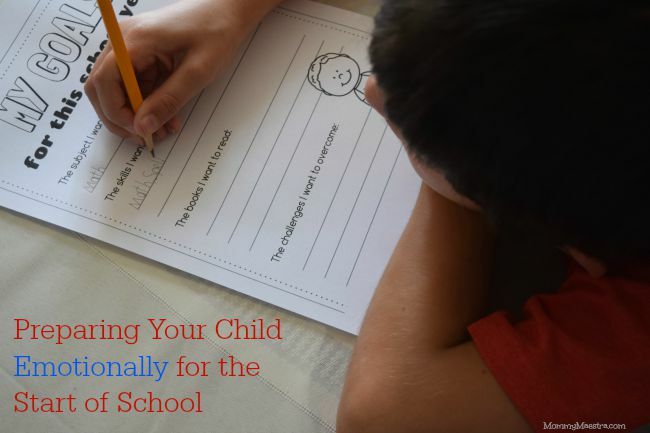 We want you to be excited about the things your child is learning and to take an active role in their journey of discovery. 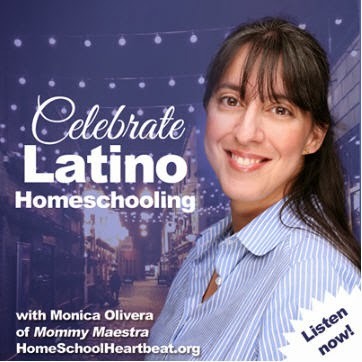 When I first started MommyMaestra almost 5 years ago, I only knew of a handful of Latino homeschoolers and there were NO blogs dedicated to education for Latino families. Today, it is rare that a week goes by when I don't get an email or message from a mother (sometimes a father!) 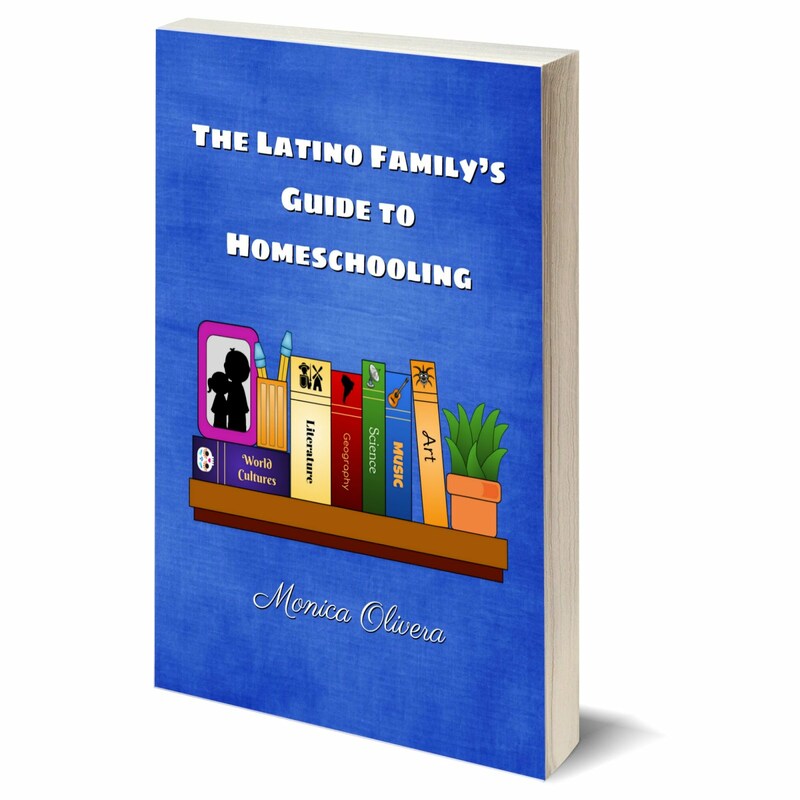 who is looking for curricula, has questions about how to start homeschooling, or needs resources for helping their child improve in specific subjects at school. A giant abrazo to you all. May 2017 be a wonderful year for your familia. "On Monday, our nation will be celebrating the values of equality and peace with a national holiday. Martin Luther King Jr. Day is an opportunity for us to discuss the actions of this historic civil rights leader, and how they affect us today. If you're looking for a fun little activity to do with your children, check out my bilingual writing activity." 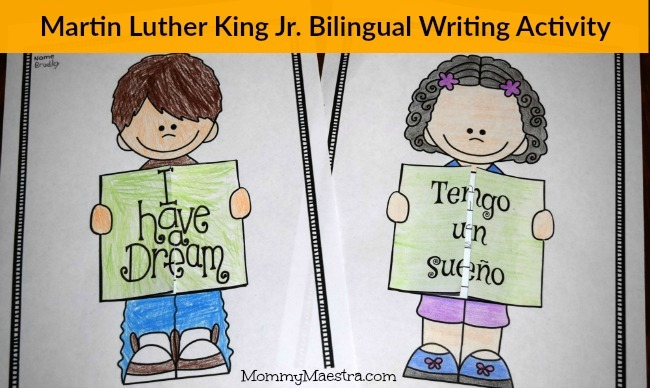 This post shares MLK resources for you to use as you introduce your child to one of the world's most famous civil rights activists. "A few years ago, I had the opportunity to interview Carmen Osbahr, the talented Latina behind the Rosita muppet. She is funny, vibrant, smart, and just as lovable as the characters she makes come alive on screen. And more importantly, she is making a difference in the lives of children all across the country - especially Latino children who have the opportunity to relate to and learn from the bilingual Rosita and Ovejita characters." 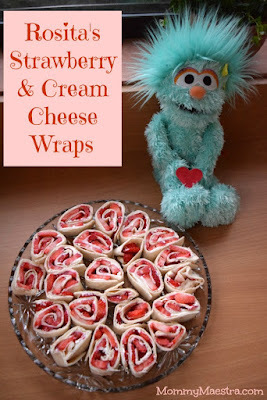 I don't share a lot of recipes on MommyMaestra, but this one that I created in honor of Carmen and Rosita and Valentine's Day, was super popular! "Learning about Mariachi music is a wonderful way to explore the Mexican culture. I hope you find some resources below that help you teach your students about this unique art form - from the distinctive costumes they wear to the instruments they play." This post turned out to be extremely popular with MM readers! 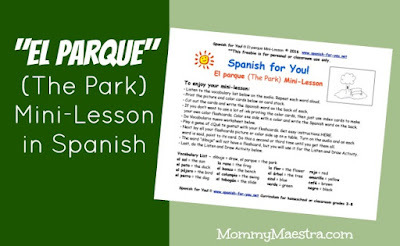 "This printable activity teaches key vocabulary associated with parks. 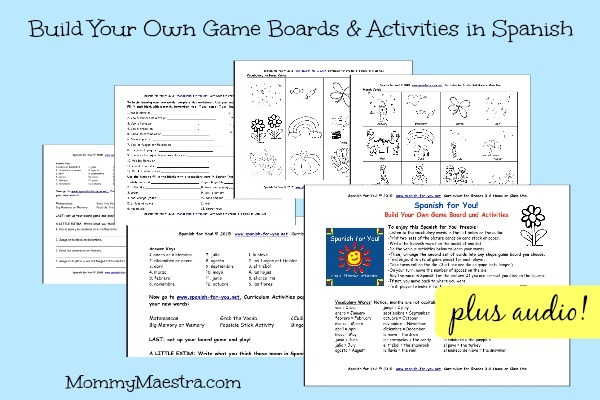 The 4-page download comes with vocabulary cards, worksheets, and directions. Not sure of the pronunciations? No worries! It also comes with the audio to help you with the pronunciation of each word. This time, Debbie has included a few other wonderful goodies for you to use, as well!" "NACHO: Libro Inicial de Lectura is an awesome workbook printed in Colombia by SUSAETA ediciones. 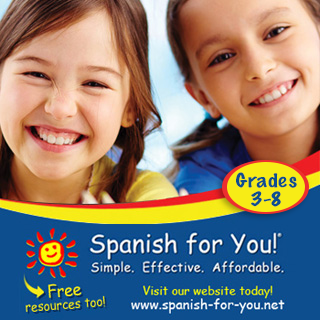 They publish a collection of (Spanish) reading and writing books for kids ages 4 - 13. This particular book is the first in the series, and helps beginning readers to master writing and reading by learning syllable combinations." One of the requests that I get on a regular basis is for materials that teach children how to read in Spanish. 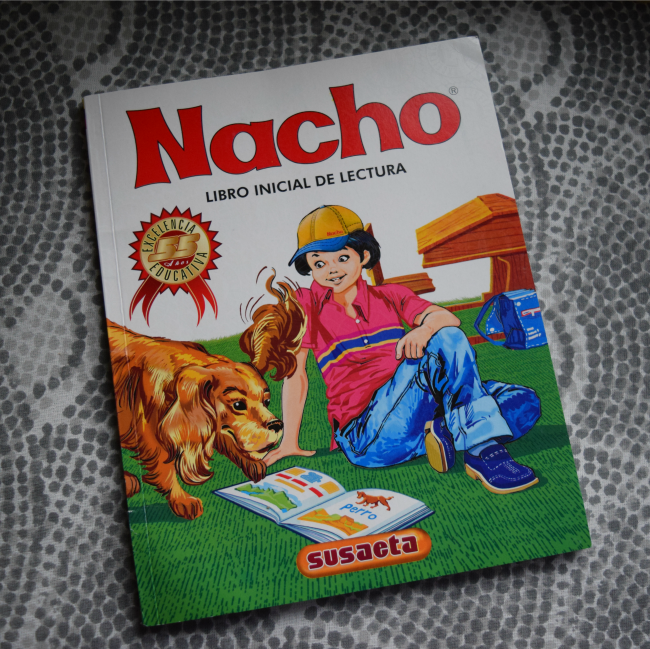 I always refer parents to my FAQ page located in the top menu of this website, but reviews of products like NACHO remain extremely popular. 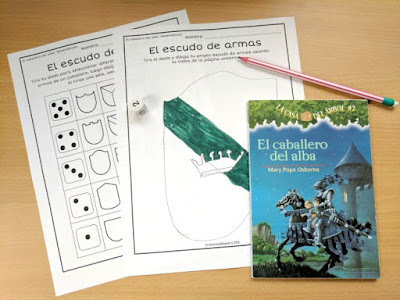 "If you have children beginning the Magic Tree House books in English OR in Spanish, I hope you'll consider this activity packet I put together. It covers the first three books in the series and has activity pages to boost your child's reading and writing skills." 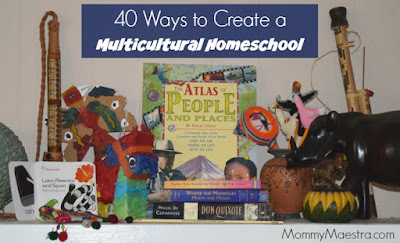 I absolutely love creating downloads for MommyMaestra readers. Some are free and some have a small fee (to help pay for all the graphics I buy! ), but the latter usually come with sample pages if it is a big file. This particular product - La Casa del Árbol - was created when a reader asked me about Spanish materials to supplement the Spanish books, but we couldn't find any! 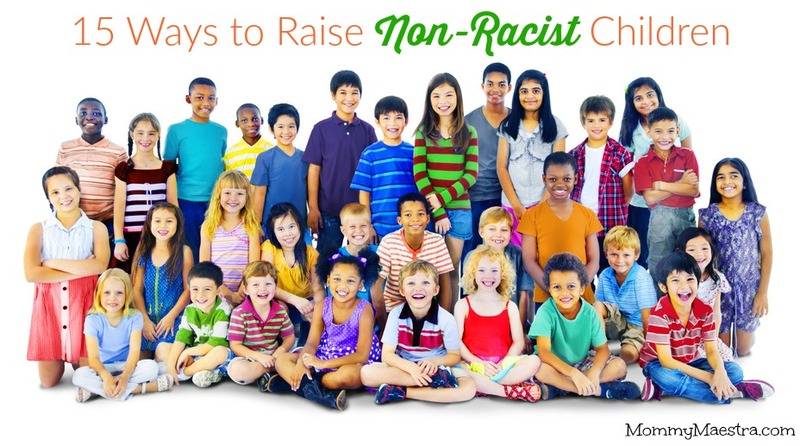 "Raising children who see beyond the color of a person's skin takes a conscious effort on the parents' part. We must deliberately teach respect and cooperation. We must destroy the "Us versus Them" mentality that has slowly permeated our culture." This was, perhaps, the most viewed post on MommyMaestra in 2016. 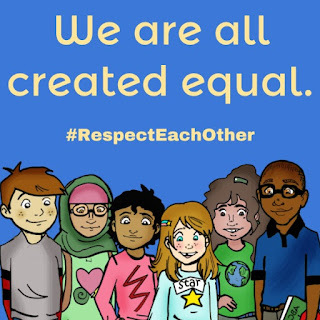 And it has such a good message with so many ways for us to raise respectful, peaceable children, that I consider it one of my best. "The other part of my co-op day and the biggest chunk of my responsibility is high school Spanish 2. This class is quite a challenge to teach in just one hour of class time per week. In the past, I have struggled with trying to use a textbook and/or class handouts to accomplish this very difficult learning experience for my students. However, this past school year, I found what I consider to be the best learning experience possible for these students. 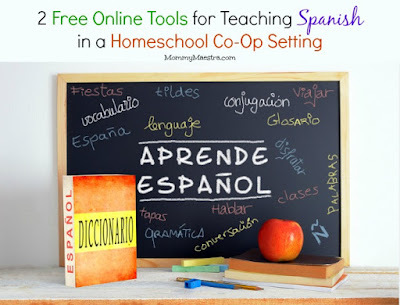 I use two online resources:"
MommyMaestra is blessed to have wonderful guest posts from moms who homeschool their children or have found great resources and are willing to share their tips with other MommyMaestra readers, like this one from Andrea Contreras, a stay-at-home homeschooling mother of nine children. Thanks to ALL the moms out there who have shared their expertise with us! Wow! September was SUCH a great month! It was really hard to select one post to feature because with so many great guest contributors and blog hops happening, all of the posts were really close. From picture books that teach Hispanic Heritage to exploring Spain with kids to what is Worldschooling, MommyMaestra was a wealth of information. Click on the subtitle "September" above to see all of the great content from that month. 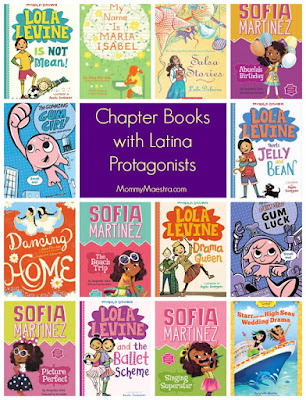 "When I was a kid there weren't ANY chapter books featuring Latino characters, much less any centered around a LatinA. That's why young Latinas today are so lucky to have not just one, but a whole slew of titles from which to choose. 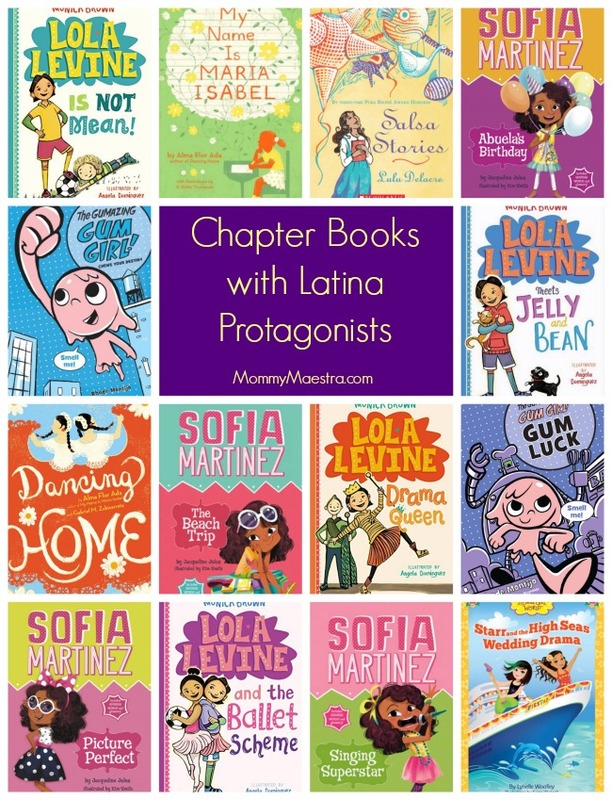 If you're looking for titles that reflect a young Latina's experience that your child or students can relate to, check out these series and stand-alone stories." 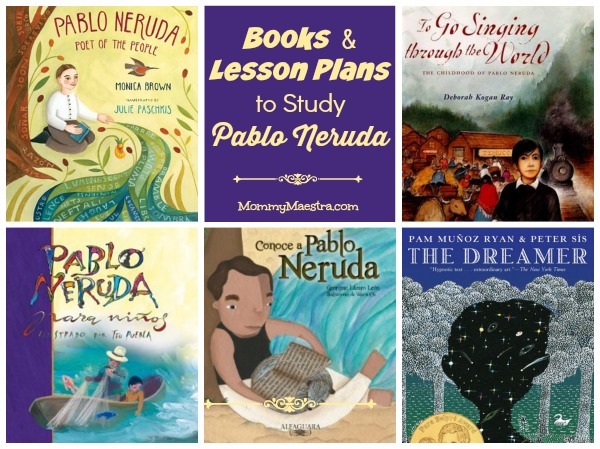 Book reviews remain one of the most popular posts on MommyMaestra. "The time to protect our families is here. We need to give our children the tools they need to defend themselves. Those tools include Caution, Strength, and a Voice. To avoid violence, we must talk openly with our children about the possible dangers they may encounter and prepare them to think quickly and act accordingly. We must urge them to be ever vigilant, aware of their surroundings, and mindful of who is nearby." My open letter to Latino parents remains one of the most viewed posts on my site. 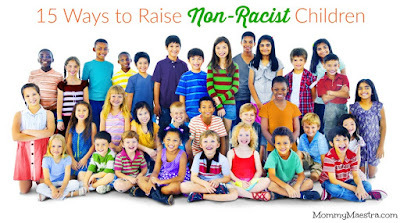 I encourage parents to prepare for the coming years and to prepare and protect their children from the growing racism that is spreading across our country. 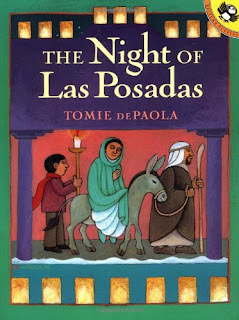 "I started looking around to see what new resources were available for celebrating this nine-day tradition, and was DELIGHTED to find a read aloud on YouTube of Tomie dePaola's excellent children's picture book, The Night of Las Posadas. It's one of my favorite stories about this holiday event." Stumbling upon new and exciting tools and resources for parents and teachers is what started MommyMaestra. 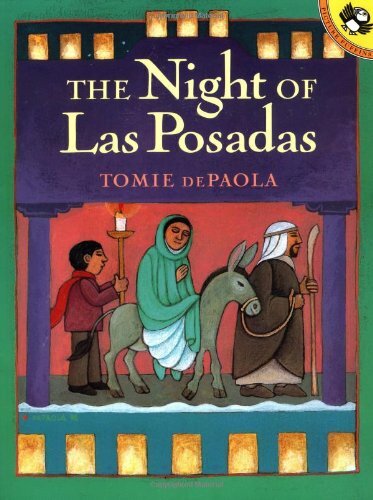 So it is fitting that December's favorite post was this YouTube read aloud centered around Las Posadas.